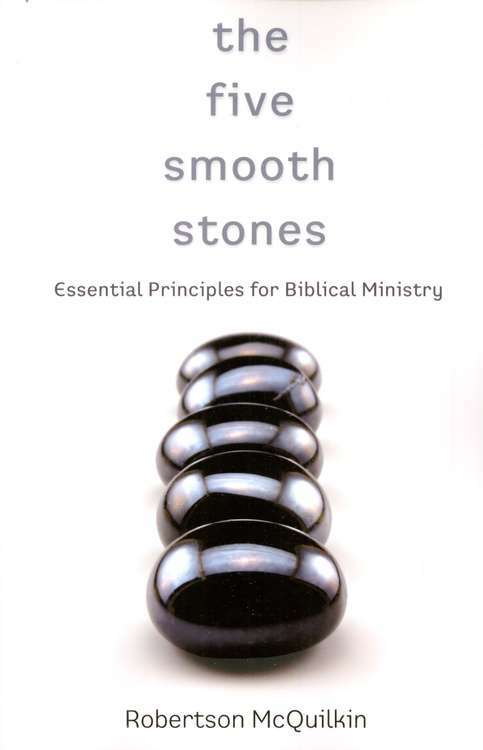 Editor's Note: The following is a report on the practical applications of Robertson McQuilkin's book, The Five Smooth Stones: Essential Principles for Biblical Ministry, (B&H Publishing Group, 2007). You work hard to do your best in ministry. But if your efforts don't seem to be accomplishing much, it's time to ask yourself whether or not you're following biblical standards. Evaluating your ministry by these standards regularly can make the difference between failure and success. 1) Make the Bible your functional authority. Recognize that the Bible, in its entirety, is the ultimate authority for faith and practice. Make a habit of studying the Bible diligently, objectively, and thoroughly. Look at every activity, plan, new idea and old tradition through the lens of Scripture to see whether or not it is consistent with Scripture. When evaluating the biblical authority of a doctrine or activity, ask these questions: "What is the basic idea behind this? ", "Is this commanded in Scripture? Is there an explicit declaration of the will of God? ", "If not commanded, is it obviously required by clear biblical principle? ", "If not required, is it permitted by scriptural teaching, compatible with Scripture? ", "Have I brought this into alignment with all biblical data that might be related, whether directly or indirectly? ", "Does the emphasis represented by this activity maintain balance with all other related biblical truth in such a way as to maintain the biblical emphases?" and "If this is extrabiblical, am I careful to make this fact clear and divest it of ultimate authority both in my own thinking and in the way it is presented?". Be aware of the postmodern concepts that are currently popular in education, entertainment, and the media, and counter wrong concepts (such as the notion that commitment is foolish) with biblical truth (how commitment reflects real love and benefits everyone involved). Evaluate your church's counseling, preaching, and teaching against Scripture to test its health. 2) Align your congregation with biblical purposes. Emphasize that worship is something your congregation should do in every part of their lives - not just during a weekend church service. Focus your church's music ministry on God rather than the people who perform, and give all people in the congregation opportunities to participate in the songs spiritually and emotionally. As you try to make disciples through your teaching ministry, make sure that people can join small groups to help them be accountable for their spiritual growth and get the support and encouragement they need. Do your best to care for your church members' emotional, physical, and material needs, such as by providing counseling, help with medical bills, and job training and opportunities. Make sure your church has ministries designed to promote the welfare of your local community, and other communities throughout the world, as well. 3) Release the Holy Spirit's energizing power. Identify the spiritual gifts and natural talents necessary to accomplish each purpose of the church, such as: the gifts of preaching, teaching, and administration; the ability to lead people to worship in spirit and in truth; the ability to proclaim God's truth through preaching with life-changing authority; the ability to teach the Bible in such a way that lives are changed; the ability to discern a person's spiritual need and give wise counsel; the ability to see practical needs among those in the congregation and to meet them; the ability to win people to faith; and the ability to minister to the physical and social needs of the community in a way that draws people toward God. Help every church member discover, fully develop, and deploy his or her gifts and talents to serve the church and the world as God is calling them to do. Whenever a purpose for your church isn't being optimally fulfilled, pray for the Holy Spirit to help in that situation. Encourage all church members to pray often - not just about their own physical needs, but about the spiritual needs of people they know, people in their community, and people throughout the world who haven't yet heard the Gospel. Urge them to pray faith-filled prayers that show they eagerly expect God to respond. Show your congregation how to depend daily on the Holy Spirit's unlimited power, instead of just their own limited abilities. 4) Equip every disciple to participate in God's redemption plan. Urge every church member to embrace Jesus' call to witness to others about the power of the Gospel to redeem lost humanity. Help your congregation learn how to show and tell others how Jesus is working in their lives. Constantly be on the lookout for people in your church who are especially gifted in evangelism, and provide the training and encouragement they need to become even more effective as they use that gift. Help your congregation learn more about the world's unreached people, and motivate them to care and do something about it, such as by praying for missionaries and supporting them financially. Encourage church members to consider becoming career missionaries themselves, and moving out into the field to serve. Plan your church's short-term mission trips well to maximize their effectiveness, prepare thoroughly for such trips, have someone in the host country supervise the workers, and provide a reentry program to help people process their mission trip experiences well. Set policies in place to make sure that the money your church sends to overseas missionaries reaches them and is used well. Encourage integrity and gratitude on the part of both givers and receivers. Encourage your congregation to pray often for global outreach, and intercede for the specific needs of each your church's missionaries throughout the year. Help your church members learn how to manage their money according to biblical principles. Expect them to give sacrificially, and celebrate and thank them for their sacrificial giving. Encourage them to grow in their spiritual maturity through investing financially in your church's ministries more and more. 5) Follow Jesus' example of servant leadership. Make Jesus the Lord of your life and ministry, and encourage everyone else in your church to do the same. Look to Jesus as the ultimate example of leadership. Set safeguards in place to deter leaders at your church from abusing their personal power. Have leaders share authority in ways that encourage them to hold each other accountable to lead with integrity. Let love - for God and other people - be the main motivation for serving as a church leader. Keep God's purposes for your church in mind. Aim to shepherd the congregation well, serving as a guide, caregiver, counselor, and friend. Take the initiative to help meet needs. Serve willingly and eagerly. Don't coerce people; instead, seek to persuade them. Let your actions speak louder than your words about how serious you are about your faith. Be humble. Pray faith-filled prayers often. Help develop unity in your congregation by encouraging people to build caring relationships with each other. Urge each church member to be filled with the Holy Spirit and be humbly guided by the Spirit and biblical principles. Motivate them to pray together often, and join each other to serve the surrounding community in various ways. Don't hesitate to exercise church discipline when necessary to maintain the moral purity of your congregation. Adapted from The Five Smooth Stones: Essential Principles for Biblical Ministry, copyright 2007 by Robertson McQuilkin. Published by B&H Publishing Group, Nashville, Tn., www.broadmanholman.com. Robertson McQuilkin is a conference speaker and writer who served as president of Columbia International University for 22 years. He and his wife, Muriel, served as missionaries in Japan for 12 years. Robertson has written scores of articles and has published several books, including An Introduction to Biblical Ethics, The Great Omission, and Understanding and Applying the Bible. His book, A Promise Kept, is a touching account of his life since his wife's diagnosis with Alzheimer's disease. McQuilkin resides in Columbia, South Carolina.